Henry Endres Winery started in 1936 by Henry Endres, Sr. It was an original “farmer winery”. 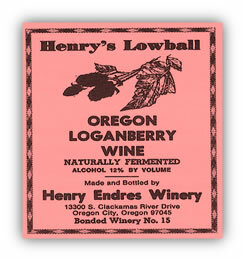 “Henrys” was known for its fruit wines, especially the loganberry “Lowball”, a mainstay in Portland area taverns. Most wines were made from fruit. Labrusca was the only grape wine. 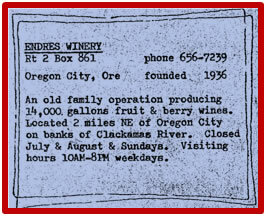 Three generations of the Endres family operated the winery. Over the years the winemaking process didn’t change much. Fermentation took place in open-topped wooden tanks built decades ago by Henry Jr. This process served the family for well over 50 years. All wines were sold in 1.5 liter bottles. Screw caps only. Every wine sold for the same price. The winery was located at 13300 S. Clackamas River Drive, Oregon City, Oregon. The tasting room was a casual affair. Just honk for service. Walk in and taste wine from paper cups. No swirling and sniffing! !